What's on the horizon for Juventus after their shock Italian Cup exit? The runaway Serie A leaders and thirteen-time Coppa Italia winners got dumped out of the cup tournament by Atalanta last night and their focus will now shift to the Champions League. Massimiliano Allegri claims that a "loss was imminent" but also admitted that the referee was right to send him off in Juve's first domestic loss of the season, a loss that means there will be no league and cup double for The Old Lady from Turin this season, a domestic double they had achieved in the last four seasons. There's no shame losing to this Atalanta side, however, who are playing an exciting brand of football under Gian Piero Gasperini, spearheaded by Colombian Striker Duvan Zapata. 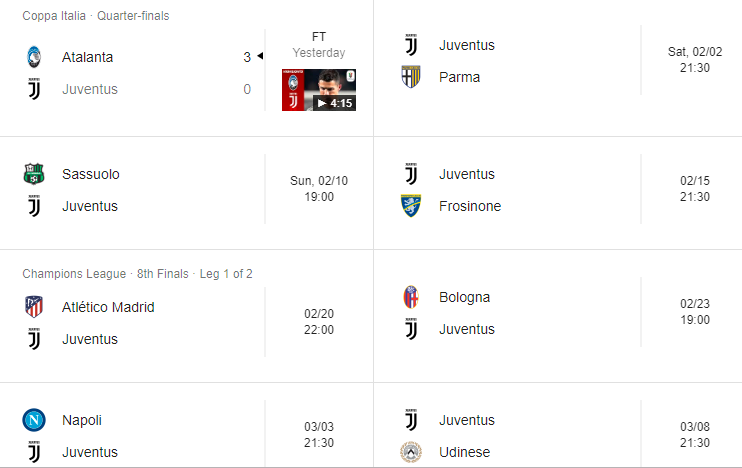 Juve will get to steady the ship in February with winnable Serie A fixtures (on paper) and then a mouthwatering two-legged clash with Atletico Madrid in the Champions League round of 16, one of which takes place early in March. The Champions League is the ultimate goal for Juventus and the primary reason why Cristiano Ronaldo was brought on board. With Napoli also on the horizon, it will be a defining period for the Italian giants. Follow the Champions League live on Futaa!